Today’s guest on the Landscape Conversations is Professor Tim Entwisle. Tim is a scientist, scientific communicator and botanic gardens director. He is currently President of the International Association of Botanic Gardens (IABG). He was appointed Director and Chief Executive of Royal Botanic Gardens Victoria in March 2013, following two years in a senior role at Royal Botanic Gardens Kew, and eight years as Executive Director of the Royal Botanic Gardens and Domain Trust in Sydney. Tim writes for a variety of science, nature and garden magazines and maintains an active social media profile with his blog ‘Talking plants’. He contributes regularly to radio, including ABC RN Blueprint for Living, and has hosted Talking Plants and co-hosted In Season. Anton: One of the questions I’ve been asking people is when did they first become aware of landscape. That’s partly a question about when did you become aware that there’s nature landscape, environment – when did things start to separate out into these different categories? Tim: For me, it really began when I was a child. In some ways, if I take a step back I really didn’t get into gardens, landscapes, and botany until I got to university. So I was a bit of a maths/physics guy for my education. But then when I looked back later in retrospect I realised my grandfather used to live in Castlemaine which is in the middle of Victoria, we’d go for bushwalks. Every time we went there – he didn’t have a car so we’d go for a walk and we’d head out of town into the scrub around Castlemaine which is old goldfields country. So we’d be out there looking for gold, that was what we were meant to be doing and we never found any gold of course. But you would see the rocks, you’d see the trees. I wasn’t really recognising that as anything particularly but looking back on it I think it gave me that interest in going outside the city limits and seeing a landscape that was quite different to what I was used to living in country towns at that time. And then eventually in the city. And then I got interested in plants and my father used to grow seeds, and I always thought that was fascinating that whole garden seed thing. And then I think it probably wasn’t till I got to the Botanic Gardens in Melbourne where I did start to work after university that I started to appreciate the beauty of a garden landscape. That’s the first one I really noticed. It took a long time for me to get there. Tim: No, that’s right. It’s a very altered landscape and it always looks like it’s upside down. But I think that did set the scene. if I went out to a forest in Gippsland, East Gippsland and I saw rainforest – I remember seeing that for the first time – and literally hugging the tree. I was a bit hippy in those days. But it was, it was quite an experience, that damp smell, the huge trees, that atmosphere, totally foreign to what I’d seen I Castlemaine, totally foreign to some of the country towns I lived in. I was born in Nhil, I lived in Euroa. These are not places that have lots of natural forest around. They have dry forest. I think I discovered rainforest, got excited by that, but then over time come back to love that scrubby kind of goldfields forest and the box forests and that open slightly disturbed interaction that you get there. I like heathlands. In some ways I’ve gone back to that dry landscape. Anton: And what about the structured nature of the agricultural landscape. Tim: Again, that’s taken me – well, it would take me a long time to get used to that. I think I rebelled against that a bit and I felt you had to go bush walking into exotic landscapes, you had to go into, up to the top of mountains to get to that. And I think it’s only, probably fair to say only in, what would I say, after I had a family, maybe slowed down a bit, maybe got used to taking children out into parks and just realising there was more than just that pure natural wilderness. I think I had this idea that wilderness was the ultimate and that was what landscape should be. So now if I go say, to the Grampians, I love the Grampians but I love those beautiful paddocks leading up to it with a single river red gum sitting in the middle of it. Lonely and kind of sad in an environmental sense but absolutely beautiful and spectacular in that agricultural sense. Anton: Do you find that your view is somehow influenced, do you see specimens now or do you see ecosystems, or do you see cultural landscapes when I’ve been in New Zealand and everybody talks about how beautiful it is and I tend to see erosion, landslip, and weeds in the creeks. Tim: Yes, you have to watch that. I do see weeds and again I’ve tried, I’ve actually probably in more recent times consciously tried to avoid that a bit and I think philosophically I’ve become a little bit more attuned. I think working and living in London for a couple of years at Kew Gardens opened up that familiarity and getting to know landscapes that were altered in huge ways. Whereas, when you live in Australia you’re brought up with that sense of wild areas and non-wild areas. So yes, I see weeds. I see plant species because I’m a botanist and because I’m interested, I’m a taxonomist really and identify things I do immediately hone in on oh, that’s such and such a species, that’s a particular tree, and oh, over there though, that’s a weed that one there. But what I’ve found myself doing more is saying look, these are beautiful weeds. I see the weeds initially but then I realise that’s an interesting plant. I might have actually done a bit of it because I blog occasionally on plants and talk about them, is I’ll look at a weed and I’ll work out what’s going on there? What’s pollinating it? What’s the flower? What’s, so you learn to love the individual if you like and put aside that really black and white category of weed/non-weed. Anton: Does that come through, do you think, the philosophy of the Botanic Gardens now? And I’m probably jumping a bit here. In terms of the Botanic Gardens, would this conflict between education, entertainment, environment, conservation and early, in the early days even examples of gardening and how you might acclimatise the country – they’re complex issues. How do they sit now? Is that changing a lot? Tim: It has changed but I think it’s still a tension in the Botanic Gardens. The early Botanic Garden directors did acclimatise, did bring plants in and they were really excited and keen to introduce new plants into the country and made a lot of mistakes. Famously, the director of the Melbourne Gardens, Mueller, brought blackberries in which we don’t enjoy so much now. But that’s changed so we’re now very careful where when we put a plant in the garden we’re checking its weed potential and all that kind of thing. And then most botanic gardens have very strong conservation overlays so we have people working there who are usually passionate about conserving plants and looking after the environment, so we tend to grow plants that might be rare and we tell stories about. We store material in our herbarea, the preserved plant collection that represent important plant species. So we have that strong overlay now of conservation. And then when people come to the Garden the displays can vary from a collection of plants – so we’re sitting here in Sydney Botanic Gardens, Royal Botanic Gardens Sydney and we’re sitting opposite a display that’s showing the plants collected by Solander, so Solander and Banks when they came to Australia. So that’s a collection based on a collection. There’s behind us a whole lot of bromeliads, so that’s a collection based on different species. There are displays here that are a little bit more ecological. Not a lot in Sydney. 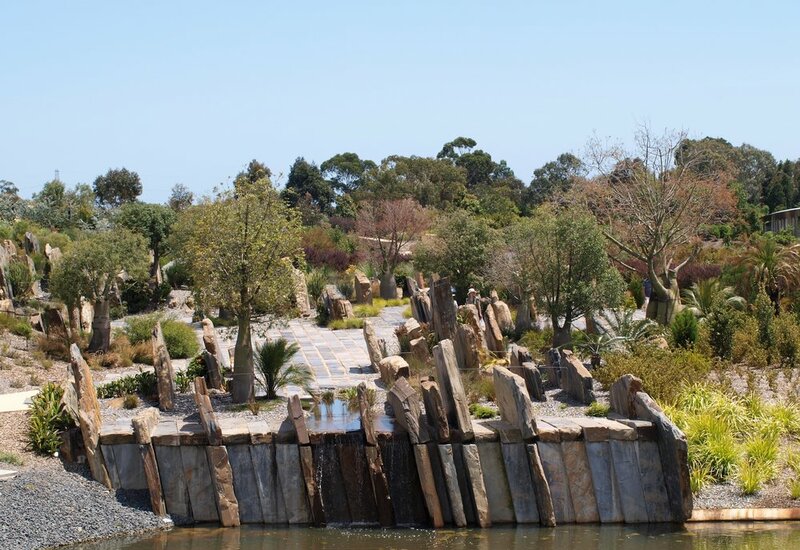 And then you go the other extreme, one of the gardens I look after now is Cranbourne, the Australian Garden, a very modern garden, a modern design but all Australian plants and try and encourage people to grow Australian plants. It has a very specific goal if you like. So I think botanic gardens are all varied and all different but there is a bit of a tension between a beautiful landscape and one that has meaning and depth to it. Anton: It’s interesting that that aspect of design and gardening was so present early on in terms of showing off potential gardening styles or the use of species. Now with the conservation aspect it’s also a tension between the botanic garden being a reference to somewhere else as opposed to its own particular environment. And where does that sit between national park and pure entertainment gardens? Tim: It does all those things and I think a good botanic garden can meet all kinds of needs. And I often say in Melbourne it’s a mix of nature, culture and science. And there’s all that going on. There’s an introduction to nature, there are cultural events and activities. It is a place where people come, it has a rich heritage and history of having from picnics through to music events. And that happens in all botanic gardens. So then those displays and the plants we show off do vary, if we just take my example in the Royal Botanic Garden in Melbourne, it’s an exotic plant collection from all over the world plus a whole bunch of Australian plants. It’s a mix but it’s a garden that’s full of the world’s plants. Whereas, the garden out at Cranbourne’s set amongst bush land, there’s only Australian Plants. I remember talking to a visitor from South Africa who was saying “Melbourne Gardens were okay but that garden out at Cranbourne, I just loved because of all the Australian plants”. And they didn’t really get much out of the Melbourne Gardens whereas, I think the Melbourne Gardens is one of the most beautiful botanical landscapes in the world. It’s a very European design and landscape but spectacularly beautiful and with an amazing collection of plants, if you’re into plants. So people see these things in different ways and I love the fact that we do show off the world’s plants because that’s the other thing I love doing, telling a story about a plant. We’re sitting under a Morton Bay Fig here but there’s going to be another plant just across the other way that’s going to be from somewhere else in the world, from South Africa, from Asia. To me that’s fantastic and fascinating for locals. And for someone visiting they need to see Australian plants and I think they quite rightly get excited by that, but also to see those in the context of a plant collection from all over the world is not a bad thing. Anton: The fact that the plantings reflect a certain attitude towards immigration or towards culture, philosophy and landscape is fascinating. Is that something that’s overtly continued ? Are you very conscious in doing new work that it is also telling a cultural story? Tim: We do work that tells a cultural story from today but also celebrating or reflecting that historical culture. And I think you do have to get that right and if you look Melbourne Gardens again in South Yarra there you’ve got a landscape designed by William Guilfoyle who’s a master designer, beautiful landscape which we don’t want to mess with in one sense, yet we’ve put in new landscapes like Guilfoyle’s Volcanos, we call it, which is succulents and cacti. And quite a showy, different sort of landscape. Andrew Laidlaw who’s the landscape designer there has designed it so that it does blend back into that main garden. It’s quite spectacular and has its own appeal. Same thing in the fern gully we’re building a few new gardens in there including a wellbeing garden and different, gardens that respond more to modern needs, if you like, yet they’ll fit within that historic landscape. So we do as directors, and I think as people working in a botanic gardens have to be quite brave. We have to try and put new things in. We have to find new ways to talk about plants. You look after that history but it should not hold you back. Every garden is a whole lot of layers and a whole lot of histories. Anton: Do you see the landscape through your botanic lens or do you see the botanic gardens through the landscape lens? What is the flow of influence between what’s obviously highly structured, in terms of the botanic gardens, even if it looks natural, and the landscape that is differently structured? Tim: The botanic garden is a constructed landscape and we have to always remember that, because it is a garden and often they’re sitting inside cities or suburban areas, and that’s absolutely fine. So you’re not recreating wild area, usually. I mean, some gardens do that and there’s an argument for that to a certain degree. But one thing a garden does is provide a bit of a first step or a bit of an entry level into discovering nature, so it’s a safe place to go. And I think that’s part of it. I see botanic gardens as almost a stepping stone for that. It’s the way of starting to get to know plants and a bit of knowledge to go out into a park (National Park), to see more when you get out there. So in regard to how they feed off the landscape, not industry, but the landscapes generally in other gardens, I don’t know that they lead a lot. I think we’d like to think we lead a lot. I think what we do do is we do bring new plants into cultivation. We get people, they come and see a plant and they’ll put that in their garden. And we do a little bit of plant breeding and selection and collecting, so we bring new things in. I like to think when we do landscape well that we inspire others to do something similar. So I think our Guilfoyle’s Volcano in Melbourne Gardens is an inspiring landscape that will get other people to not only think about a broader range of plants in a drying climate in Melbourne, so some of those succulents whether they’re Australian or overseas, but also the ideas it gives in terms of just using the rocks and the plants and that sort of creative structure as well. We do that, and as I was saying, with our new fern gully and definitely the Australian Garden (Cranbourne) our idea is to inspire. When we’re working at our best we’re out there leading. But I think a lot of the time we do reflect trends and we reflect society and landscape interests. We tend not to be usually too radical. I would suggest as organisations we’re probably a little bit too conservative at times. Anton: The systems that botanic gardens are projecting, are obviously highly botanical, but is there a shift now with the conservation movement and with the growing importance of ecology to accommodate a bigger system. And I’m thinking, for instance of the flying fox issue that has come about and how you balance this need for a system of botany or scientific system that clashes with a natural habitat system? Tim: The flying fox populations that lived in both Sydney and Melbourne are a really good example and I think tested the whole Botanic Garden model. And you’re quite right, there’s a local animal that’s set up home in these botanic gardens. We’ve destroyed a lot of its habitat so it’s under stress, and it’s found the Botanic Garden. And it was a really interesting debate and discussion to have with the community, I’ve had that in Melbourne and in Sydney and, as to how you deal with this issue of having so many animals in the botanic garden that they start to destroy those plants. And as you say, in a botanic garden where I’ve been saying we’ve got this collection of plants and we’re worried about those individuals, they might be from overseas, they weren’t natural to this area except probably just a half a dozen trees or so, and it’s really about that collection. But you flip that around and you think about a museum collection, you think about the items we might have in a museum, or you think about an opera house, or you think about another cultural institution. If some animal or creature or natural thing came in and started to destroy that we would want to protect that. So that was one side of it. I think you do need to look at gardens as a collection, as a cultural landscape, and these all have really strong values for the community. In terms of the way we have adapted to the environmental change we’re accepting more about, or explaining more about the environment. Having and celebrating animal life is part of that. We do actually, in all the gardens, talk a lot about pollination and talk about how animals and plants interact and I think as we get more mature we can do more of that. I don’t think there’s an either/or .But in a case like the flying foxes the numbers and the impact is so dramatic we have to find a way to shift that impact from the Botanic Gardens, move them basically. And the arguments are around well, maybe we could have less in the botanic garden, it doesn’t work that way. They come here in tens of thousands or they don’t come here at all. Some people would say just fence off the garden and keep it as a flying fox sanctuary because that native animal is more important than the Botanic Garden. Now, that’s a value judgement for the community, I would suggest, and I said at the time the community has to decide – me as director, I’m here to look after the Botanic Garden and it’s collection so therefore flying foxes are a problem. The way you deal with that though is, what constructive thing can you do. They had been moved, they are, they did get moved. They’re now somewhere in Centennial Park, somewhere in other places. So there was a solution. It might not be perfect but it allowed the Garden to persist, allowed the animals to persist and like everything in life in a city it’s a compromise. Anton: It is a bit unfair that the botanic gardens are lumped with that problem, in a way. As you said that’s the result of urban pressures and what other questions are now coming to bare on the botanic gardens? I did read that Sydney’s quite unique in having major botanic gardens so – not Sydney, Australia – in terms of having, the major cities having botanic gardens very much central to their urban core. Tim: Yes, they are. I think most of our gardens are quite close to the city which is a good thing, so more people come in. And the pressure that puts on is numbers, as numbers go up – I think there’s three to five million come to Sydney Gardens and we have two million come to Melbourne Gardens. That can be a lot of people on some days. And part of the appeal of a botanic garden is that it’s almost a place for contemplation and tranquillity so that’s kind of an issue. But that’s maybe a problem we can work on. But there are pressures from the use of the garden too because the gardens are set up, I said about that nature/culture/science, they are collections. We want, there’s a whole lot of information and knowledge we’d like to get across to people about how important plants are and how, not just for health and living and breathing air and all that kind of thing but also as part of our cultural life. And so to do that, we want the garden to work towards that end, if you like, and set up the collections and signage and interpretation but a lot of people come here just for a good time. Anton: Having been in Kew not so long ago, do you see a big difference between the way that the idea of landscape and the botanic garden is embedded in the culture there compared to what we do here in Australia? Tim: It’s almost clichéd the English generally love gardens and there is this real strong passion for gardens. We say we do and we do a little bit but I distinctly remember we had a garden display at the Hampton Court Flower and Garden Show where we did really well, Melbourne Gardens won the best in the show. The really interesting thing was when you were there, when it was built and when people were coming in, lots and lots of Londoners, lots and lots of locals, lots of people from across the U.K., the questions and the interest in the plants from Australia, and the level of discussion .. I don’t notice the same thing here. We all mix with people who know about plants and gardens and landscapes and we think everyone’s plant literate. I just found literacy there was a much higher level. There is a passion for gardens and also an interest in knowing more. There are shows on gardens and they have the Chelsea Flower Show. The BBC, every night at prime time has an hour on the Chelsea Flower Show. You just don’t get that in Australia. It’s numbers a bit but it’s also this deep passion and interest. Anton: Is that at the horticultural level or at the design level, or is it the environmental level? Tim: It’s horticultural and it’s an interest in growing plants, it’s this propagating and mollycoddling and that kind of thing, it’s about nurturing a plant I think. The design, there are some beautiful gardens. There’s clearly some lovely designs in the U.K. And I loved all the beautiful gardens there. I have to say after a while I get a little bit almost blind to it because you see so many beautiful green gardens because they get the rainfall and everything, and they’re very nicely designed that you longed almost for something just a bit different and a bit of variation. And that’s the appeal, the thing you get of course is that seasonal change but it can be too green. Anton: Especially for an Australian. Tim: Yes. Well, that’s right. We do look for the greys and those different kind of colour palates, yes. Anton: Given that we are in a world of disturbed landscape and that botanic gardens are very controlled, is there room in the botanic gardens for this disturbed type of plant community landscape. Tim: There is. It depends on your garden, with the main garden in Melbourne because it’s such a single landscape designed as a single piece you don’t have much room for that. Although, we’ve got some little back areas and one of the things we’re thinking about in our future plans is to create areas a little bit less kept and a little bit more, not necessarily meadows but they can be areas that can be disturbed, people can move logs around and families and others can come in and rearrange the site a bit. And that’s unusual for a botanic gardens, we tend not to do that. We have a children’s garden there that’s been really, really popular and that – again designed by Andrew Laidlaw and a few others – but that’s not play equipment and that not that kind of thing, it’s about plants that are interesting children and a different kind of landscape. So that was breaking if you like, with the very formal landscapes. There’s definitely room for it. We don’t do a lot, I’m thinking, I’m whizzing around Australia thinking of the gardens and there’s not a lot of that done. There is room, when I was working here in Sydney one of the discussions we were having was around community gardens and whether we should have them here in the Royal Botanic Garden or whether, maybe we could have some in the Domain. Or alternatively, is that something that’s done in the streets and in different places, so it’s a really interesting question. I think it’s a bit about space and room and just trying to do everything. It’s a bit hard to do everything. Tim: Not always. It’s waxed and waned. I don’t think you could argue that necessarily around Australia at the moment. On my way here today I had a person say to me, the Sydney Gardens had changed a lot of recent years and it had become less botanical. And I think what made them say that is that they saw more bedding plants, more flower and colour. They said that they liked that, incidentally. But there are also more events and more razzmatazz which they didn’t like. And I think if you went and asked a lot of people that come into the gardens you’d get two views on that. You’d get those that are enjoying the gardens opening up, being more a part of the culture in the city. You’d get a bunch who’d say they’re not focussing on plants and science enough anymore. I think this attention actually works to our favour and I think if we do that nature/ culture/science thing and we actually work them all together, we shouldn’t be scared of it. I think sometimes we get defensive and I don’t think we should be defensive about science, we’ve got to find ways to be a science communicator, it’s no good just having a herbarium full of plants, preserved plants, having labels on all the plants and having the collections in neat rows and saying this is a scientific institution, get used to it. What’s the point of that? So to me your backbone and your heart is the science but you can have a whole bunch of things around that. And you should have. Anton: How about those who hold the purse strings, our political masters, where do they see botanic gardens going? What’s the philosophy from government, about botanic gardens? Tim: That waxes and wanes too with both the community expectations and different political parties, The thing that I notice in Victoria particularly, we are in an environment department so it’s important they appreciate the work we do in conservation. They also see us as a tourism destination. We need to at least to have one of our gardens in the city and that’s obviously a tourist attraction. Then what we’ve been doing in Melbourne, and we’ve been consciously doing this, is talk about the food and fibre, we talk about agriculture, we talked about the role of our collections and plants in those areas and how an informed community can make better decisions. If you look at climate change, if you’ve got a government that’s focussed on and understands and appreciates climate change, which we have in Victoria, then it’s about supporting that and providing the plant side of that story. So the governments in a way can reflect what we and the community want. I think in all cases they’re going to want a mix of things and they are going to want sometimes for them to pay their way. So there’s an imperative in that and all cultural institutions have that, zoos, museums. There’s an aspect of being a director and running a garden that’s about that. And that’s fine too because partly you do things to make money, but also it is about people coming in and being happy and enjoying the experience. So if you’ve got an event that’s consistent with what you’re doing – it doesn’t always have to be about plants, but there’s a connection there in some way. If you can find that connection then I’m comfortable with that and usually governments are comfortable with that too. But yes, I would say there are bigger debates, and you would know here in Sydney, whenever someone talks about some development in a Botanic Garden, it’s controversial. And it should be. That’s a good, a really good thing. The only thing I would hope and ask is that people look at the nuances of that. It’s not just, if there’s going to be a building in a botanic garden think about why it’s going to be there, where is it going to be, how does it add to that experience. If there’s going to be an event in a botanic garden is that, how does that fit into the garden. Anton: Just picking up on the agriculture could you just talk to that. Tim: Yes, it’s a historical interest in botanic gardens. You go right back to the start, the early directors, Joseph Maiden here in Sydney Gardens, and some of the other early directors have a very strong connection with agriculture because the country was starting to be explored and trying to grow new plants and was trying to break out into new areas. And the botanic gardens were part of that, so they provided information. And they’re often sitting in agricultural departments. I think Sydney Gardens used to be in one, sitting in agriculture. What we are trying to do with Melbourne and I think other gardens are as well is look at a role in supporting agriculture in a variety of ways. As a conservation organisation we collect seed, we have seed banks and we look after native plants and indigenous species of our area. But a lot of those are crop relatives or wild relatives. So you’re growing the wheat and rice but there are relatives of those, and cotton, that grow in the natural flora. So we connect up and we do that in Australia. We do that overseas with the seed banks that are working on agricultural crops and we make sure we’re protecting the genetic material that might be needed at some point. Or we might be protecting a plant that has medicinal use, has traditional use, has Indigenous community use in Australia that we don’t recognise yet, which I’m sure is the case with a lot of our species. So we work at that level. And then there’s a whole lot of things that we do around access to the variety of life. And I know a lot of people working in the food industry and fibre industry are interested in new varieties, new material, new products and a botanic garden can put them in contact with that. And that doesn’t mean necessarily taking a plant out of the garden, giving it to a company and they go and commercialise. That’s a simplified version of it. But we often will give them access to, tell them where they might go and look for a plant, and we can give them the information they need. Anton: And if you could speculate for me on how an Indigenous view of landscape might impact on your physical makeup of the gardens or the direction gardens might take. Tim: There’s a great example – I suppose not so much landscape but of plants where the First Encounters Garden here which is showing that great tension of the first settlers to Australia from Europe come in contact with Aboriginal people and not recognising that there was food and that there were materials they could access and then starving and not being able to grow their crops. And that’s demonstrated in a botanic garden. But I think probably more importantly it comes back to recognising the location and the place, sense of place where you are. And we have what’s called Long Island at Melbourne Gardens in which we have local flora but we also have some connection to the local communities that were there before the botanic garden, before the settlement of Melbourne. And again, part of our planning for our next masterplan of Melbourne is to expand that area and connect more strongly with the local communities, the Kulin nation that live in that area but also with the history of the site. And we’re right on the Yarra River and that’s an incredibly important thoroughfare and was for the communities for tens of thousands of years that people were living in that area. And as a botanic garden, I think we have a responsibility and there was a community expectation, that we also interpret that as well. So we can have these wonderful displays of world plants which I like, we have some displays of local plants, but we also need to show some connection to the land. And this probably comes right back to your point about where you are and your place is important and we should find ways to reflect that. And I think the Indigenous culture’s a really good way for us to do that., We are called the Royal Botanic Gardens in Sydney, they’re called Royal here. It looks exotic as a landscape. And we can get criticised and I have had these kind of discussions with people that it’s a bit of an old fashioned idea that’s just hanging on, that it is part of a European culture that’s really just plonked in and has no connection with the place. And that’s a legitimate thing to raise and a really important point. We had some poets do some poetry around the gardens recently. It was half Indigenous poets and half of non-Indigenous. Quite a lot of the poems mocked our royal title and made fun of the fact we had all those exotic plants. Which is good. You’ve got to question that. I’m comfortable with that part of the garden but it doesn’t mean you shouldn’t also reflect that other aspect. Anton: You’re on the edge of the bay in Sydney, you’re on the Yarra. To what extent is that estuarine or riverine environment embraced in growing underwater plants, Is that really the responsibility of a maritime museum rather than botanic gardens. Tim: When I used to work in Sydney I was quite keen on this, my research interest is algae so I like things that grow underwater. In Sydney I was really keen on the idea that here we have a botanic gardens sitting on the harbour, we’re showing off the land plants and all the trees and shrubs and then just under the water there are these fantastic plants, these seaweeds, the algae, interesting flora and fauna, ecosystem that we’re not interpreting at all. I was quite keen at one stage to have some kind of underwater connection and I think it’s absolutely part of what a botanic garden should do. There’s no reason we should just focus above ground level. There’s no reason we don’t focus underwater. It’s hard, aquaria and other places are probably more experienced at this, but I still think for Sydney there’s an opportunity, I don’t think you would necessarily garden because it’s natural, I think we should treat it as a natural landscape, it would be like a bit of national park. You don’t want to alter it but view it. It’s a great opportunity. What we have is a few signs out here in Sydney that say we have people that work on algae, look over the edge. And that’s as good as I was ever able to achieve. In Melbourne on the Yarra it’s so muddy. But I’m a kayaker actually and I flatwater kayak on the Yarra in that muddy area. I go up and down it and I love the river and I’ve always had an attraction to rivers. So what we will do in Melbourne, again with our future planning, is to have a river gate and open up to the riverside so that people can come up to the gardens from the river experience, see a bit, be welcomed into the gardens through a landscape, and a planting that introduces them to the botanic gardens and also that interprets the river a bit.For us and the Yarra River it’s a bit harder to show what’s underwater but we can actually demonstrate the landscape around the river. There’s a few reeds and things that you might interpret in some way. Anton: That brings me to the other unknown or unseen species. I guess, botanic gardens when you think of them straight off the grand, trees the heroes, the heroes of the botanic world, the flowers and the trees and I know with your interest in algae, this increasing view towards what some of those things can do. How do you see that playing out in botanic gardens and coming into play more? Is there a way, do you think, that could become more prevalent? Tim: It’s a bit like looking at the underwater environment. It’s one that’s harder to do and we’re not used to interpreting it. And it’s smaller and it is more difficult. So things like mosses and lichens and the unseen world I think is a fascinating area for gardens to think about how they might focus on . If we build a glass house for example, and we’re looking at one in Melbourne, I’d like to think somewhere in there we can, like you do with alpine plants, bring them up and closer. You have got to display them in a way that will bring you down to that level, some way of bringing you into close contact. You might have to enlarge them. You might have to have some photographic representation. There’s a fantastic new, relatively new museum in Amsterdam, Micropia which is all about bacteria, algae, fungi, and it’s an indoors museum but it’s run by the zoo. They cultivate and grow. Out the back through a glass wall you see people in lab coats growing the specimens just like a zoo, and they bring them out. I love it, it’s a really creative museum. I’d like to think botanic gardens might do a little bit of that, to find ways to bring that part of the world to people’s attention. It also fits in with even the detail of flowers and the small aspects of trees that we don’t see. There are parts of botanic gardens that you miss, how do you show those off, how do you get people to look inside a flower, how do you get them to see the really fine fascinating architecture that’s inside a flower and why it’s set up for a butterfly to land on or a randy wasp to come and try and mate with an orchid. All these fantastic stories that we tell. To get people to look at those you need to set up a little artificial environment, it’s a bit like a zoo and I think that’s where we stretch ourselves into that area. Anton: Maybe just to finish off sitting here across from the city. The interaction between the city, the urban with the botanic gardens has been, as you said, a bit of an island or somewhere you go to get away from the urban. To what extent do you think those pressures we talked about earlier are also affecting the form? Are you seeing the need to engage with the city more wholly, or expand what you do into the city? We talked about Maiden and plants going out to regional centres. Tim: It’s interesting, in both senses I think gardens do have to respond to that. The landscape has to reflect a little bit about the city growing around it and if your community is changing then you do need to perhaps alter those landscapes in fairly subtle ways. The Melbourne Gardens were designed to block the city out deliberately and most places in the garden you weren’t able to see the city. But now the city has risen up on one side, the buildings are much higher and you can see it. And in fact one or two areas we’ve opened it out so you can see it. So where it used to be a barrier, the feeling I have now is we should be less about that and welcoming people in. So in some ways I would like to break that barrier down a little bit while keeping the, it’s an interesting tension again, keeping the magic. So it is a magical place but it’s not separated, so you welcome people in. The other side, the flipside of extending out in the city, yes we should. I think sometimes we do stick within our walls and our fences and as a botanic garden we can take on a much bigger ambassadorial role and I’d like to see ourselves in Melbourne sitting out more in the Melbourne, city of Melbourne area and that might be through pop up gardens. There’s some ideas around at the moment of a kind of a highline garden near Flinders Street Station on the old railway line, I’d like the botanic gardens to be involved in that kind of project. I have been, in recent times, working with the Level Crossing Authority where they’ve been taking away level crossings in Melbourne and putting in 22 hectares of new landscape. I got involved in that and helped lead a community panel with police and a whole lot of others to help work on what went in those. And I think that’s good for botanic gardens. It’s more controversial, you’re in the community environment where some people want sporting parks, some want to walk their dog, some people want native plants. But if we’re not part of that discussion, not part of that debate then I think we are irrelevant. Anton: Very good. Well, thank you, Tim. There’s so much to cover there. It’s really fascinating. Tim: Enjoyed the chat, thank you.